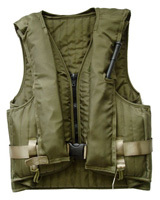 ROARING FORTIES™ SMA1294 Army Assault Vest is used by the Australian Commandos & Australian Special Forces and has an inflatable jacket within a closed cell foam personal floatation device (PFD) --- a Hybrid. 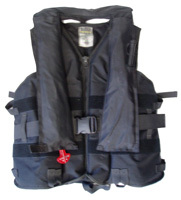 The inflatable jacket has a buoyancy of > 156 newtons and the PFD (foam vest ) has a buoyancy > 56 newtons. Even without inflating the life preserver, the foam PFD is able to support a soldier in full uniform to a safe position. This assault vest is used for covert operations. Bladder color is black and the valise can be olive green or black. Features include a C-light, 33gm CO2 cylinder, mouth tube, whistle and roll back reflective tape.